This solution to modeling exposure for transgender models may seem simple at the surface level but has become a struggle within the transgender community as the fashion world is slow to accept and include transgender fashion models to represent their brand. 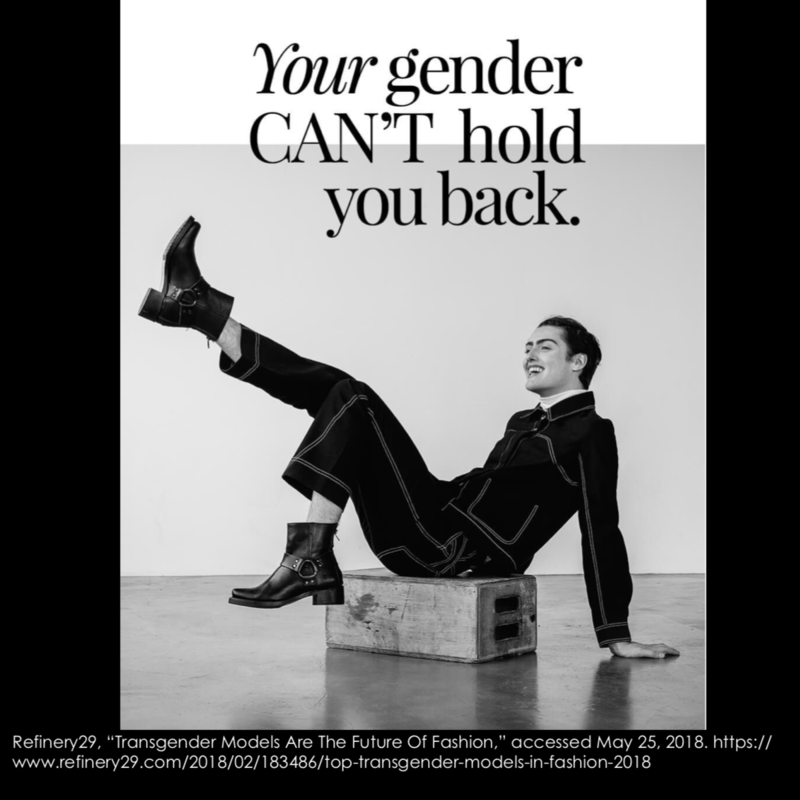 In the article “Fashion Industry Still Lacks Inclusivity, Transgender Models Says,” by author Carlsbad 2018, he interviews a male to female Transgender model Peche Di on her views about the topic and shares her first-hand experience and expertise on the subject. Carlsbad begins with “Di discussed the importance of representation of transgender people in the modeling industry and the ways activism on social media has fostered a strong community for transgender people” (Carlsbad, 2018 pg 1) According to the article by Carlsbad 2018 “Transgender model Di discussed the importance of representation of transgender people in the modeling industry and the ways activism on social media has fostered a strong community for transgender people” (Carlsbad, 2018 pg 1). Peche Di and the research author have both concluded that there is a lack of inclusion of Transgender models in the fashion industry and that this is an essential platform for Transgender people to represent the Transgender Community. Transgender fashion model Peche Di gives her insight and experience as she reflects on her career as a fashion model, “A lot of modeling agencies in New York City are trying to tell you-you’re too feminine be like a man, act like a man, they try to change you to suit the type of model that the brand would like to represent. Transgender fashion model Peche Di said her industry still is not fully inclusive of all models, including different races, body types and gender identities” (Carlsbad, 2018 pg 2). Many modeling agencies fail to represent Transgender models as their chosen gender identity. For example, if a Transgender model was assigned male at birth but chose to transition to a woman, these agencies will try and represent them as a male model despite their gender transition or gender identity. Dismissing the model’s gender s can be a problem and will cause Transgender models to feel excluded as their gender presentations are ignored. Carlsbad and Di, 2018, continue, “There are still things that I will never do because I am trans. There are still certain jobs I won’t get. But I feel like the boundaries are starting to diminish. People are starting to realize that trans women and trans men are like everybody else. The doors are opening up more” (Carlsbad, 2018 pg 2). While there have been improvements, the industry still lacks inclusivity and opportunities to represent various gender identities as celebrated by the transgender community. 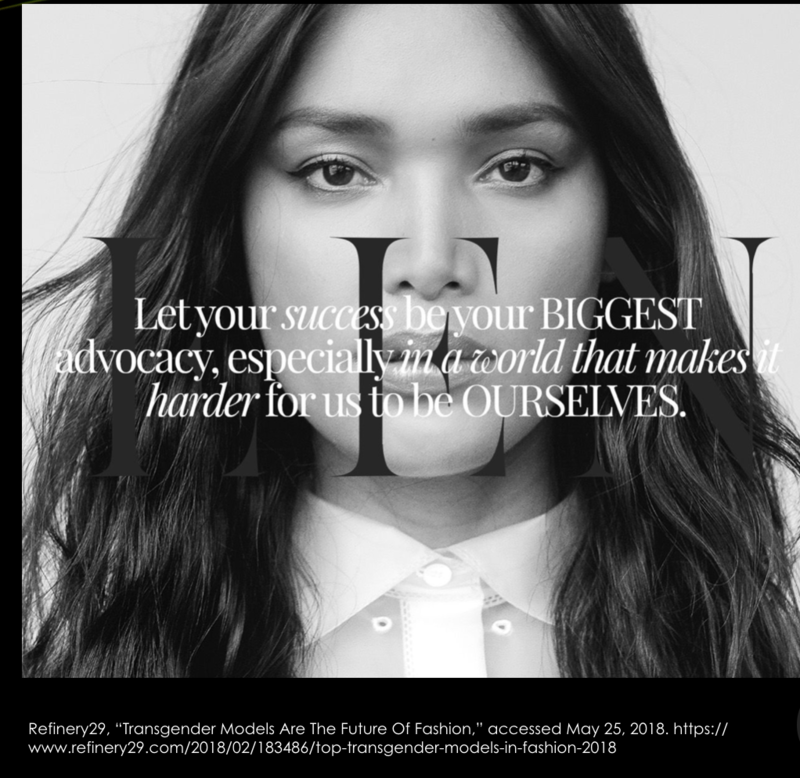 Education about the Transgender community has helped move the career of Transgender models forward as more models from the Transgender population are represented in the fashion world. The Transgender community would like the opportunity to modeling jobs that are offered to cisgender individuals. Cisgender people are women who are assigned women at birth and men assigned men at birth who showcase their gender identity in compliance with gender normative culture. Cisgender models are given more opportunities than Transgender individuals who stray from their assigned at birth gender.